Set 5 x 5 cocktail napkins out at your bar, drink table, and to use with appetizers during your milestone birthday party celebration. Available in many color options, these quality, 3-ply paper napkins will add a custom touch to your birthday celebration personalized with a festive design and your own special message. Napkins are made from non-recycled 3-ply paper in the USA. 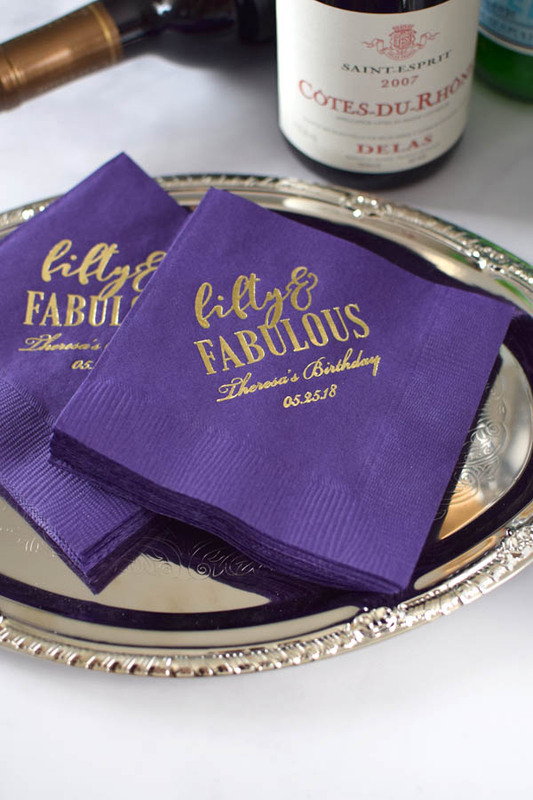 Order napkins to match your custom printed party cups, koozies, and plates personalized with a design and three lines of custom text in your choice of imprint color. The ideal size for serving with cocktails or appetizers. The 50 & Fabulous cocktail napkins came out beautiful!! We couldn't be happier with the final product. Thank you! Good quality. I would have given a 5 but I wish the spacing for the print would have been a little better. I think the spacing was a bit to close. Came out perfect, great customer service, quick delivery. My item was shipped and delivered to the wrong address, however after speaking with Representative Kris, another order will be printed and shipped. Great Customer Service Kris, thank you I will order from your site again. These added a nice touch of class for the party of regular old napkins. I was very happy with the look of the personalized napkins. Unfortunately, when the napkins get damp (wrapped around the glass) the lettering comes off. Very disappointing. I ordered these custom cocktail napkins. TippyToad made them just the way I want them! They are perfect and will definitely add that touch of flare I am going for to my celebration. These napkins were good quality. The printing was neat, accurate, and looked beautiful. Very happy with cocktail Napkins, loved the color & font. Came quick and were good quality.